More than 150 industry employers and graduate schools met strong student prospects from Southern Illinois University Edwardsville during the Career Development Center’s (CDC) Career Fairs held Wednesday-Thursday, Oct. 4-5. 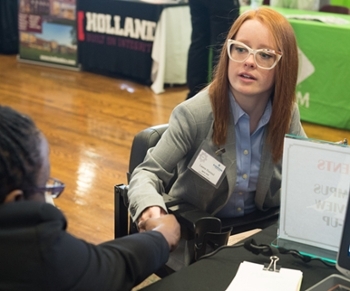 Heightened attendance by area employers at SIUE Career Fairs can be partly attributed to the successful candidates they have recruited from SIUE in the past. Several SIUE alumni represented companies during the fair. Senior civil engineering student Evan Spurgetis, of East Moline, also met with interested students on behalf of his employer, Larson Engineering. Spurgetis earned an internship with the company after last year’s career fair. He’s working there part-time this academic year, as he finishes his degree and has signed on for a full-time spot upon graduation. He viewed his internship as an “extended interview” of sorts, because he wanted to stay with the company. The October Career Fair was geared toward students from the College of Arts and Sciences, and Schools of Business and Engineering, as well as all non-teaching majors. The CDC will host a Health Career Fair/Residency Showcase for students and alumni on Monday, Nov. 13. Additionally, the CDC will host a special roundtable event, Financial Matters: Ask an Expert, from 2-3 p.m. Tuesday, Nov. 14. For a complete list of CDC events, visit siue.edu/cdc. Photos: Lauren Hammel, a senior engineering student from Highland, explored employment opportunities during the Fall Career Fair. 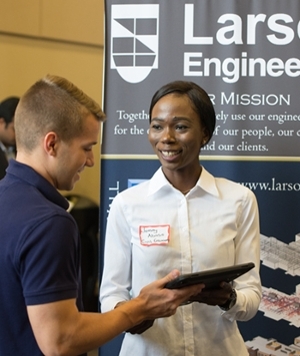 Evan Spurgetis, a senior civil engineering major and employee of Larson Engineering, spoke to SIUE graduate student Jumoke Abass about career opportunities during the Fall Career Fair.